So did you find the album yet? Lovely post on Franco and metadata! Rumba on the River: A History of the Popular Music of the Two Congos by Gary Stewart. He weaves the music and the politics in and out. @xcroc: Yet another book to add to the pile of books to read. At this rate I'll never catch up. @AfricaLiving: I did find the album and it was as I remembered it, strangely restrained. There's definitely an element of resistance in the music. Dude dude dude! You approach the seemingly mundane with such finesse & precision. A discussion of the mans name/title fills a whole page without getting into his music or band history much. Thanks for the post. 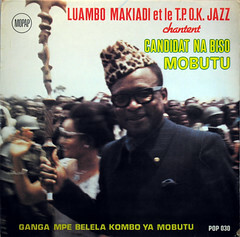 I read somewhere that albums specifically for local consumption had Luambo Makiadi while others had Franco on them. K, I am one of those 9.000 users on last.fm, and I indeed had a lot of problems with the naming conventions for all of these fine Franco tunes (and I guess I am also very German when it comes to these details, so thx for pointing this out). Another issue is the "category". As for me, I've meanwhile given up and categorized everything from Africa as "African". Highlife, Soukous, Benga...even traditional whitchcraft music recorded by David Fanshaw during the 1960s ==> "African". Why? Because my Nokia mobile (= mp3 player) only identifies tracks by their mp3 tag. Don't get me started on the category issue. I too have defaulted to using African as my catch-all genre for the manifold musics of the continent. (Sidenote: I still have some remnants labeled as afrobeat, but I'll get to those later). It is surprising isn't it: popular music is something that has so many niches and yet here we are, confined to a limited syntax. I like the last.fm solution: tags. Indeed. But only if there's a way to save these tags (of course chosen from a list of predefined tags so no further typos) within the music file so that they will never be lost. I don't know what David Weinberger would think about this though as everyone sure has his/her own tags to music. 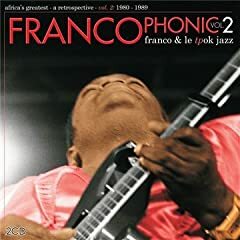 I'd be happy to chose from a limited array of tags only and/or some music anthropologists come up with the *correct* :-) way to tag all of these Franco tunes (I had chosen "Franco Luambo Makiadi & TP OK Jazz" back when I tagged my collection using mp3tag). I'm another last.fm'r and while the naming conventions for Franco are confusing and ambiguous we can count ourselves lucky that his music is even available. The Pandora database, a last.fm rival, has very little "African music" (or any other non-western genres for that matter). I'm told this is because they don't have a classification system for non western music--this seems like a feeble excuse. A pandora user had this to say: "Right now I'm listending to a pandora radio station I named African Beat Radio - and what is playing is pop Portuguese music (yuck) because Pandora loggers tell me this track features: sophisticated harmonies, catchy hooks, portuguese lyrics, r&b roots, and brazilian influences - none of which would describe African music. But really, none of that is appropriate for someone requesting African music. The only connection is that the Portuguese were colonialists in Africa for a time." When I tried Pandora, the only Franco that it could find was a Mexican pop balladeer. Better 66 Franco's than zero. Categories ! Wow that is a thorny issue. If the tech do not allow I understand but I find it in bad taste to categorize music, food, art and others as African. When not talking meta geography i.e African deserts categorizing as African gives the false illusion of a small homogenous or closely interrelated characteristics. My main pain is of course when I visit a blog with thousands of recordings from all over the continent and the most specific tag is 'African'. I may like Congolese Soukuoss but not South African rap having those as one is beyond criminal. In iTunes i save songs to most specific genre and then use 'smart' playlists that automatically pull these together into larger groups of related genres - like having Mali, Guinea Burkina together but excluding Juju . Anyways thanks for the post great read as always. What a great article, combining search engine philosophy and one of the giants of Congolese music. Interesting that you touch on the language issue, too. I run a discography of East African music on 45rpm singles (yes, it's a niche but nobody else is doing it) and constantly trawl for new records to add to the listings. A simple typing mistake, putting Kenia rather than Kenya, into a Google search unearthed a batch of new information from German speakers that I had never guessed was there. It features rips of albums I have never seen or heard before, so it might cut the number of routes to Franco a little bit. If anyone owns Kenyan or Tanzanian reocrds that aren't on it, I would be delighted to hear from them! As a music lover and librarian, I really enjoyed this post.